A landmark book on the role economics can play in developing nations has been revised by the School’s Professor Tony Thirlwall – forty years after he first wrote it. Professor Thirlwall’s Economics of Development is now in its ninth edition after first appearing in 1972. Described in reviews as a ‘landmark text’, the revised book includes new materials and case studies to provide students with an updated overview of the economic aspects of growth and development. Professor Thirlwall said: ‘It is very gratifying to complete this ninth edition, which is the most thorough revision to date, some 40 years after the first edition appeared. 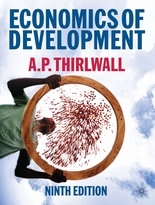 The new (ninth) edition, of Tony Thirlwall’s textbook on economic development will be published by Palgrave-Macmillan on 8 April with the new title Economics of Development: Theory and Evidence, with new chapters on institutions and economic development and on the functioning of land, labour and credit markets in rural societies. The first edition was published in 1972. This entry was posted in General, Research on March 30, 2011 by sk558.